Back in March I ordered a Bear Creek Arsenal .223 wylde upper. Up until now I had only shot at paper, this morning the wait had finally gotten the better of me and I went out earlier than usual to check trail cameras with the idea of calling before starting my checks. I set up on a narrow stretch of ground between two other properties and hadn’t had the call going very long when I can see something shiny at the other end of the field I was overlooking. With the sun shining on him while he stood in front of a milo field really made this coyote stick out. He stood at the field edge for some time just watching but he just wouldn’t commit to leave the milo. 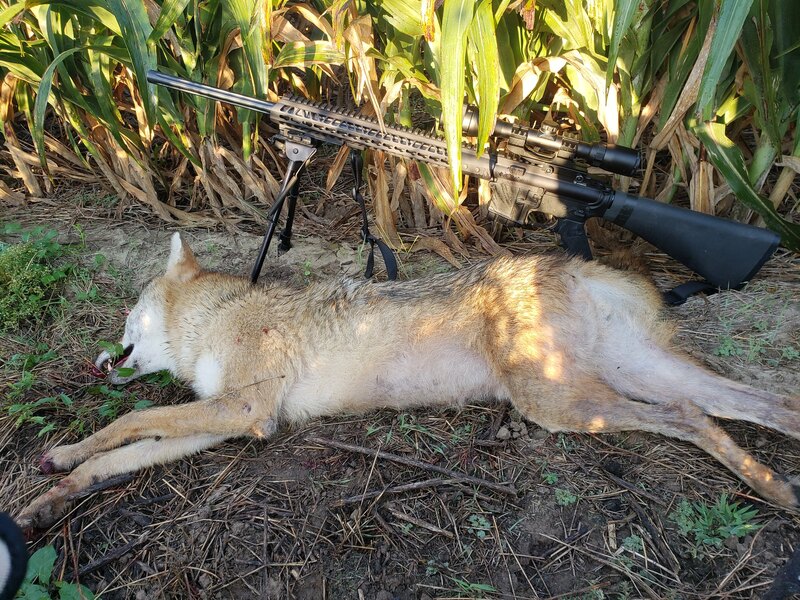 My range finder showed that he was 226yards out so I took aim and was able to watch him drop through my scope as well as hear the sound of the bullet hit him. I don’t normally start my season this early but I just couldn’t wait to take this new upper out for a hunt. Hopefully I didn’t use up all my hunting luck on this first stand of the season. Sounds like you lucked out and got one of the good BCA barrels. Nice shooting. Congrats nice shooting. Its always nice when they respond quickly. Thank you guys, it has me very excited to see what the rest of the season has in store.